What: Kid-sized Turkey Burgers with healthy Quinoa and sweet Carrot and Onion blended in (plus a secret ingredient). Fresh grated Parmesan adds tangy dimension while, drumroll……. Apple Sauce, yields a juicy Burger with plenty of sweet and savory qualities. When: The perfect make-ahead, super-portable protein meal, Mini Turkey Quinoa Burgers are fast to prepare if you pre-cook your Quinoa and boil a handy pre-peeled bag of Baby Carrots (I find these perfect for baby snacks and for cutting up into pastas and salads) in advance. Boiling the Carrots to soften is optional and something I do most often when the child you are feeding is very young – if you don’t have time to do this, just chop them very small. They will become tender when cooked. Once you have you Quinoa and Carrots ready, this recipe is just a matter of mixing. You’ll find it easy to make a big batch of Burgers for the freezer or fridge. You can also break them up into Pasta for a Turkey Meatball variation. Note: I must point out that there has been some flap about baby carrots. I, for one, am satisfied that the organic brand I use is sound, but decide for yourself! Nothing wrong with peeling the big boys instead! 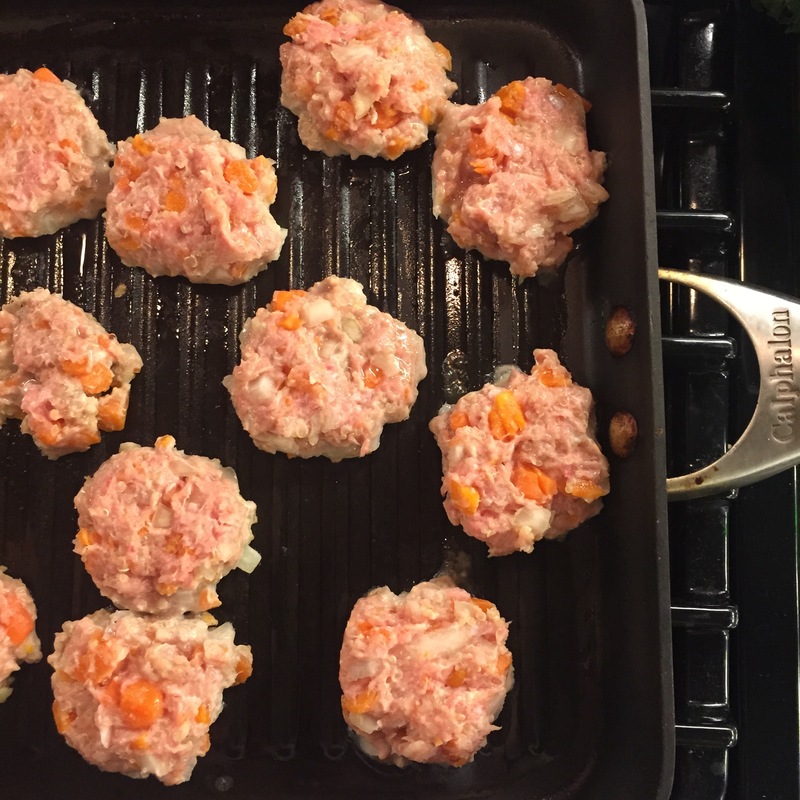 Why: These little Turkey Quinoa Burgers tempted my son to break his week-long meat boycott. He was going through a phase where he was just all about the grains and carbs. My son has already been through three batches of these burgers, and I believe that it’s their handheld nature that entices his independent streak (he wants so badly to feed himself) and the pleasing taste and aroma (you will love them too!) that keep him coming back for more. Store a big batch in the freezer and you have a meal at the ready at all times! How: A few minutes to mix and form and then about 15 minutes on a skillet or indoor grill pan is all you need to prepare these easy to freeze Burgers. You can also bake them right in the oven, which is my personal favorite. I serve these without the bun, but mini slider rolls would work perfectly for them. I didn’t use Egg in this recipe because my son is sensitive to it -I’ll provide you with instructions for a no-egg option. If you’re grilling it in a pan, you must treat the burgers a bit delicately but the grated Parmesan acts as a sufficient binder. If egg is not a problem for your child, you could certainly add the white of a lightly beaten Egg to mix. (Optionally you may add 1 lightly beaten egg if you are not preparing this egg free – it will help to bind the burgers). We suggest you make a batch of Quinoa and Boiled Baby Carrots in advance. This recipe will only require a small amount of each, but both ingredients have so many other uses! Both items are also optional – the recipe works fine with Boiled Carrots or uncooked Carrots which have been finely diced, and you can go without the Quinoa or grain as well. That said, Quinoa (and all sturdy grains) stores well in the fridge for up to 4 days, which is about as long as you can store the cooked Carrots. I mix Quinoa it into my work-lunch salads and create other baby dinners with it too. Prepare Quinoa according to package instructions ( I only use water). You’ll need 1/4 Cup Cooked Quinoa. Set a small pot of water on the stove and add the Baby Carrots. Allow to boil continuously for 2 minutes and turn the flame down to low. Cover and cook until Baby Carrots are fork tender but not mushy, about 8 more minutes. Drain and cool. Coarsely chop them for the burgers and use the leftovers for a great, handheld baby snack (perfect for baby led weaning). Mix the Ground Turkey, Quinoa, Minced Onion and (optionally)Boiled (and then Chopped) Baby Carrots (and optional beaten Egg) together in a bowl. Grate Parmesan into the bowl. Add Applesauce and a small dash of Salt and Pepper. Mix again using your hands. Do not overwork. Skillet/Stovetop Option: Lightly Oil a skillet or grill pan (I spread the Oil around with a paper towel) and turn the heat to medium. Form mixture into small balls (about a heaping Tablespoon each) and gently press into two-inch patties on the skillet. Allow to cook undisturbed until the first side is quite firm (so that the Burgers will not break up when you turn them), about five minutes, taking care not to burn. Carefully turn Burgers with a spatula and cook on the opposite side over medium-low heat until cooked through all the way (break one open to see). This should take another 5-7 minutes. Allow to cool a bit and serve!